Life is Strange: Before the Storm wound up being one of my favorite surprises of 2018, and now Deck Nine Games’ surprisingly great adventure game is finally wrapping up with the release of its bonus episode: Farewell. Unlike the rest of the prequel, which starred Chloe Price as she started to lean into becoming a rebel, this takes place in a much more innocent time that has her hanging out with the first game’s protagonist, Max Caulfield. 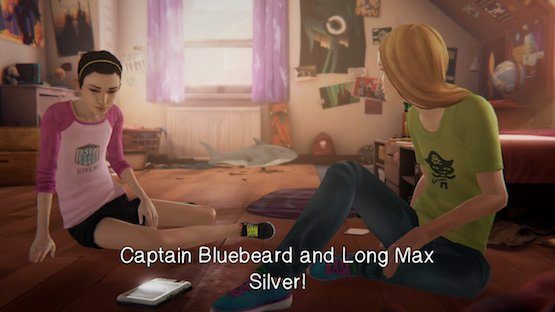 The bonus episode trades in the life-or-death drama for some pirate shenanigans, as Max and Chloe discover that they had previously buried a time capsule when they were eight. This leads to players having to figure out their own pirate puzzle (which involves going into the terrifying Price attic), and it’s just a fun framework for the entire episode. It’s only fitting that such a bonus that relies heavily on nostalgia, would also feature longing for the past as a theme. Beyond the pirate backdrop, Farewell also provides a pivotal moment in both Chloe and Max’s lives since it takes place right before Max moves to Seattle. It’s a telling look at the moments where their childhoods began to end, and their shift to adulthood took place. It all ends with a scene that players of the first season are familiar with due to its own flashbacks, and that means there isn’t much of a happy ending to hope out for. There’s no rewriting history here, and both characters have to go through some personal struggles before they meet again. Farewell is easily the shortest episode of Life is Strange. I guess that’s to be expected as a “bonus episode,” but the core story beat does wrap up a bit too quickly. I really wanted to see more of Chloe and Max hanging out as kids, as it was so refreshing seeing this less serious side of both of them. On the bright side, there are some really brilliant moments that are hidden in the periphery. Players that look around every environment will be rewarded with some callbacks from prior episodes, and some really enjoyable bonuses. For example, I stumbled upon a choose your own adventure book that the duo had made as a school project, and wound up having a blast actually playing a long with it. This is something that can easily be overlooked, so players will only get the full experience if they take the time to really let things sink in. This slower pace is definitely intentional, and it isn’t a bad thing at all. So much of Life is Strange is centered around high drama, so it’s refreshing just getting to see kids being kids. It’s a look at a simpler time. One before any teachers were kidnapping students or time-rewind powers. It’s a different side that we’ve seen glimpses of during episodes, but one that rarely gets a chance to breathe. That’s one nice thing about Farewell. Players get to definitely go at their own pace, and really come to grips with saying goodbye to both Max and Chloe. Sure, there’s a story to the episode and some fun lore to learn throughout the way, but it’s almost all secondary to what the player is experiencing. With the uncertain future of Life is Strange 2, who knows if players will ever see this duo again, and there’s just a certain comfort in seeing them goof off and have some fun. Before the Storm‘s bonus episode doesn’t feature the series’ best writing or any pivotal choices, but it all works as intended here. It’s just a fond farewell to a friend. One that gives players one more opportunity to see two of their favorite characters interacting with each other, and one final chance for the player to say their own goodbyes. Life is Strange: Before the Storm Farewell review code provided by publisher. Version 1.05 reviewed on PlayStation 4 Pro. For more information on scoring, please read our Review Policy.